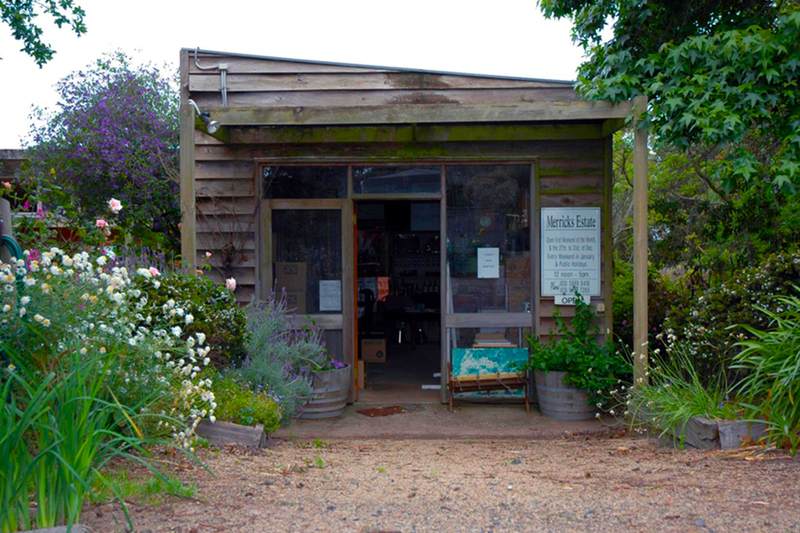 Estate Grown on the Mornington Peninsula. Situated on lush gentle slopes in sight of Western Port Bay, Merricks Estate was one of the first commercial vineyards, planted in 1978 by the Kefford family as a trial to explore the possibilities of wine making in an area that was then known only for its farming and horticulture and tourism. 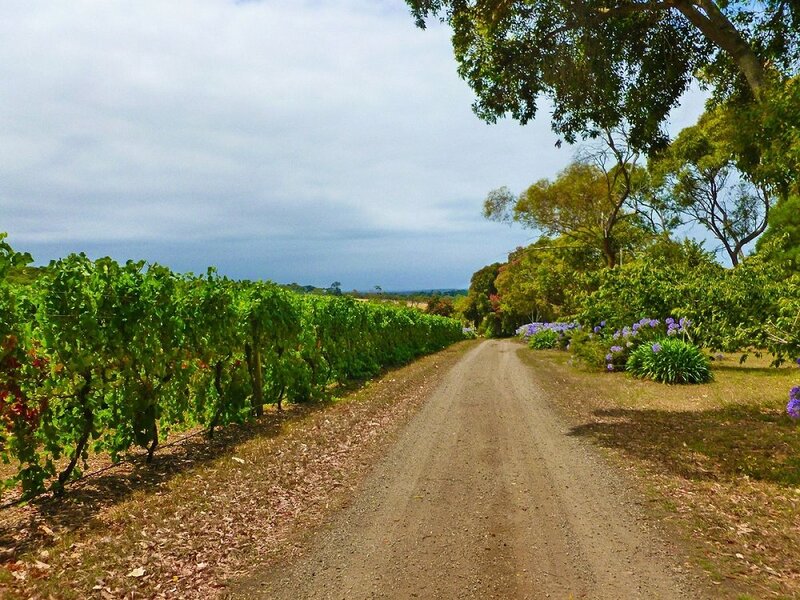 Today, the Mornington Peninsula in Southern Victoria, produces some of Australia’s most distinctive wines because of its cool climate and long ripening season. 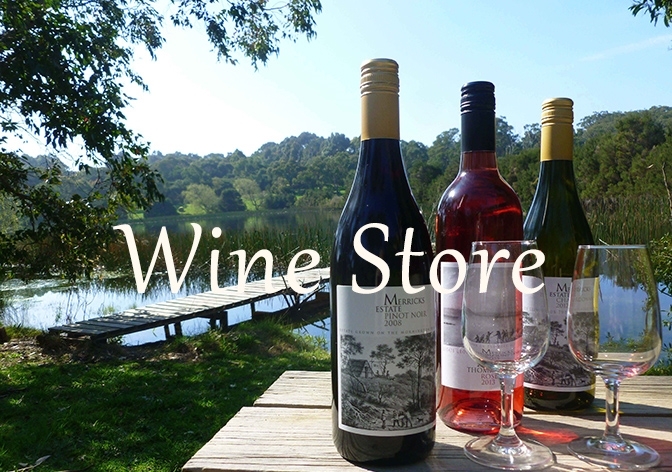 Merricks Estate produces fine wines, while striving to create a sustainable environment for flora and fauna. Since 1982 we have produced high quality wines including Chardonnay, Rose, Pinot Noir, Shiraz and Cabernet Sauvignon. Our 55 acre property (10 acres under vine) is a beautiful and relaxing place to visit. Merricks Estate, at the end of Thompson’s Lane remains the unchanged landscape of the unique Peninsula hinterland. 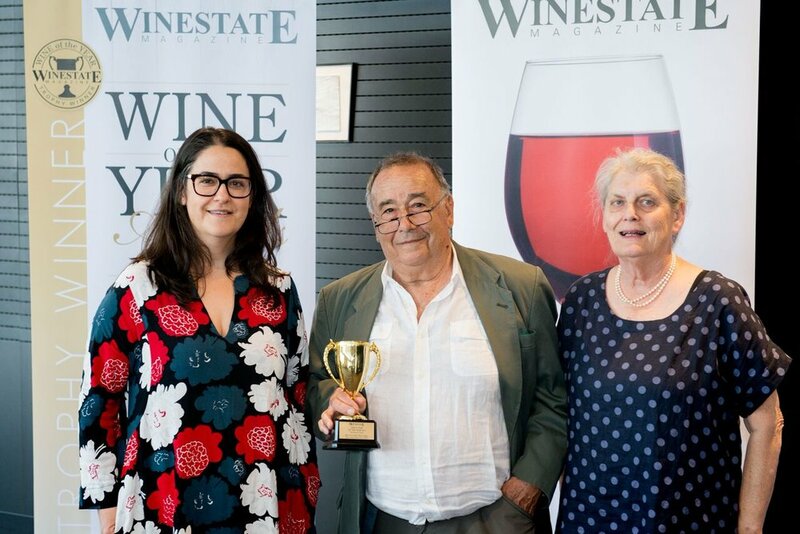 Crafting unpretentious and impressive wines"
Meticulous attention in the vineyard coupled with some of the earliest plantings of Chardonnay on the Mornington Peninsula are the driving force behind the 2017 Estate Chardonnay. Skin contacted, cold settled, barrel fermented, lees work and partial MLF. Stone fruit and citrus are harmoniously supported with considered winemaking building complexity, structure, texture and ultimately balance. A fuller style befitting some richer food matches including Guinea fowl with wild mushrooms and slow roasted tomatoes. The 2013 vintage displays aromas of sweet cherry and plum entwined with earthy notes, rich clove and cinnamon spices. Fine tannins and fresh acidity balance and linger, with a hint of white pepper on the finish. 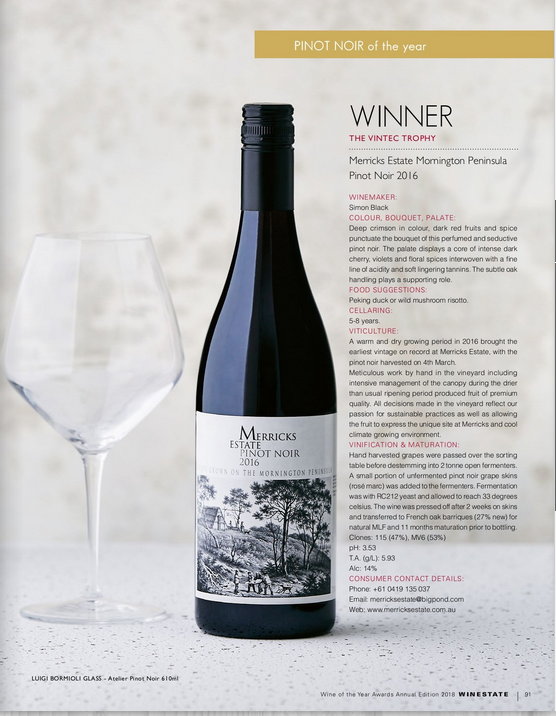 Merricks Estate 2014 has intense aromas and flavours of black fruits, liquorice and spice including intense black pepper and cedar characters. This wine is supported by good acid and fine grained tannins which give it balance, length and structure. Our distinctive Cabernet sauvignon shows cassis, blackcurrant fruit and chocolate characters. A deep purple red, it’s emboldened with fine savoury tannins and spices that you’ll only find on a perfectly aged wine. a hint of earthiness leads into just the right amount of toasty cedar to finish. Victorian Rosé - 2017 Royal Melbourne Wine Show. Bronze medal (equal best Mornington Peninsula Rosé) - Victorian Wine Show. This Rose is a blend of Pinot Noir and Shiraz. Delivering savory red fruit aromas of strawberry and macerated cherry with hints of wild flowers and spice . The palate blooms with roses, strawberry and glace cherry frame this delicious, floral and beautifully balanced Rose. It finishes dry with a dash of lip smacking acidity, that leaves taste buds begging for another sip. This wine displays a rich nose with typical cool climate characters of black cherries and plums. This is complemented with licorice and earthy aromas with a touch of pepper to finish. 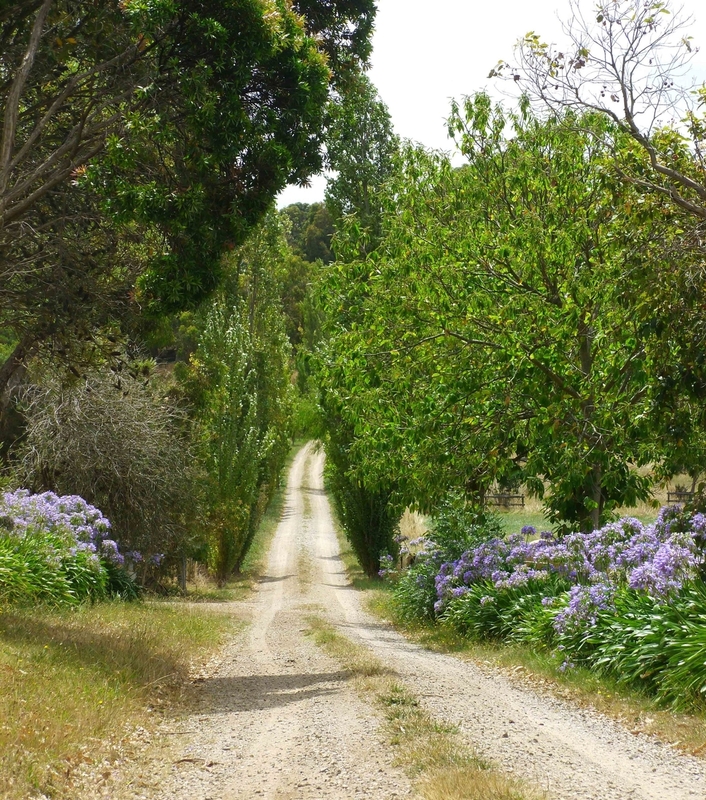 The drive is an adventure in itself...come and discover our hidden oasis!